Death helps us to understand the reality of life. Death opens a vacuum, an emptiness which is the perfect soil for the operations of spirit. Emptiness inspires all talents, inventions and creativity itself. Creativity, time after time, retreats back to emptiness. All religious places of worship are linked to burial or cremation – only the perception of death invokes a passionless existence and substantiates knowledge. Both the emptiness and celebration are divine. Emptiness is in you. Celebration is in you. The Ma’randing warrior dance is performed to welcome guests of higher social ranking. The dancers, dressed in traditional warrior costumes and carrying various military attributes such as shields, swords and helmets honor in dance the courage, resolve and strength of the deceased. The warrior dance is only performed to the most courageous high-ranking members of the community. The traditional Torajan cemetery in Lemo village. High-ranking and wealthy members of the community are buried in graves that are hollowed out of steep cliffs. The Torajans believe that the more abundant in grave goods the grave of the deceased is, the longer the deceased can enjoy his afterlife. This makes it especially important that the caves be as deep and spacious as possible; preparatory works for a burial can take as long as two years. The unusual shape and relief of volcanic Sulawesi Island are evidence of the pro-long period of geological change that took place in this region million years ago. Mountainous locations, from 300 to 2800 m high, open onto breathtaking vistas throughout the island. Death is one of the most mystified stages of human existence. Death is not welcomed in any way, shape or form, even by those who ask for it on their deathbed, while the name of death is usually spoken of only silently or in whispers, and always with deferential dread. Throughout history and across cultures death has always been afforded the utmost significance and reverence. The event of death is marked by a variety of rituals and ceremonies performed to honor the deceased and to prepare him or her for the afterlife. These rituals, however, often tend to lose some of their mystique and sense – in our common environment they have simply become an empty ritual and we have ceased considering both the true meaning and the motives that lay behind these actions. This fact is thrown into stark relief when we are faced with the funerary traditions of a faraway foreign culture and are forced to question our own understanding and customs. The seemingly incomprehensible rituals and images we come into contact with can, as it were, cause thoughts to flood in and lead us to a better personal understanding of the two worlds – here and there – and the gap that exists between them, along with all the other questions and thought that would not have entered our mind had we stayed home. Kuala Lumpur, Malaysia. My adventure in Southeastern Asia has been ongoing for the last two years. I tend to travel without concrete plans, choosing instead to follow the flow, with only a few landmarks set out in my mind which can always be changed if something more exciting comes my way. Sitting at the confluence of the Klang and Gombak Rivers, chatting with a Japanese woman I have just met about further travel plans, the direction she proposes – Tana Toraja – seems pretty enchanting. Having browsed a few images of the place on the Internet, all my remaining doubts disappear. Soon after leaving Makassar, the capital of Sulawesi Province, and heading towards Rantepao, the cultural center of the Toraja ethnic group, I am overcome by the beauty of the primordial nature that surrounds me, seemingly untouched by human hand. My eyes can hardly take in what’s in front of me: vast mountainous vistas wreathed in dense mysterious tropical forests. In the faraway distance – a rainbow takes shape, while other on – the rain falls, and all around me sonorous-voiced birds offer songs in the background of a purling brook. Taking in such beauty, it is easy to start believing that life could last forever! Tana Toraja is one of the most mysterious locations in the world. This mountainous region on the island of South Sulawesi is one of more than 17 thousand islands that form the Indonesian archipelago. It is here that the ethnic Torajan community carefully fosters their animistic funerary customs and the worship of ancestors. 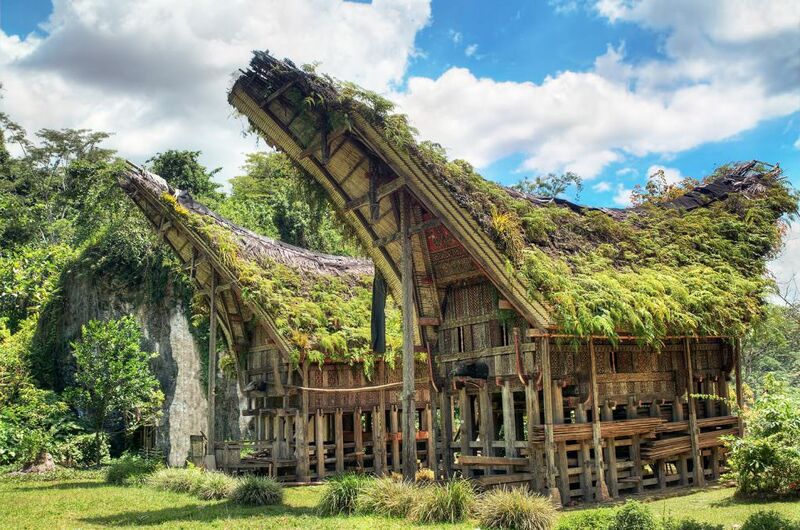 Tana Toraja means “Land of Toraja” while the name of Torajans originates from the language of the Buginese ethnic group: to riaja means “people of the highlands”. The Torajans themselves, however, have never used this name. Up until the 20th century, when the Christian Dutch missionaries became interested in the highlanders, the Torajans identified only with their villages – an extended family community. Although the customs and lifestyle took similar form between Torajan villages, differences existed in their dialects, hierarchical structures, ritual practices and traditions. Ke’te Kesu is one of the best preserved traditional Torajan villages, and attracts the largest numbers of tourists. The traditional ritual houses tongkonan are richly decorated in unique wood-carvings that are made using a complex technique. Long unbroken lines, spiraling in circles from right to left, symbolize all forms of health and wellbeing. As in other Torajan villages, Ke’te Kesu houses are arranged in two lines stretching from East to West. Most Torajan villages have sites delegated for animal sacrifices. These sites are marked by menhirs – large upright stones, called rante by the locals, each of which is built in commemoration of some important community member. The Torajans believe that if a family provides a certain number of buffalo to the family of the deceased for sacrifice – the same number of beasts should be given in return to that family for one of their funerals. If the family can’t afford to return the debt with the same number of buffalo – the two families become bound by unbroken family ties. Such communal family relations – remnants of pre-historic megalithic culture – are not practiced in any other cultures in the world. The Torajan belief Aluk, which means “the way”, is officially called Aluk To Dolo – “the way of ancestors”. Aluk is not only a belief system but also a combination of law, religion and customs that strictly regulate social life, agricultural traditions and ancestral ritual that have lasted for centuries. Therefore Aluk is sometimes translated as “the law”. The highest Torajan earthly authority is a minaa: a shaman, the representative of ancestors and gods whose words and actions must be followed in both daily life and while performing death rituals. The details of Aluk vary throughout the villages but one law is strictly followed by all family communities – the rituals of life and death must be separated. The Torajans believe that combining of the ceremonies of life and death may cause the decay of the deceased’s corpse. Prior to the arrival of the Dutch missionaries both rituals of life and death were of equal importance to the Torajan people. However, as the process of the Torajan conversion to Christianity took place, their life rituals became prohibited, leading to their eventual decline. The highlanders were left only with their funerary ceremonies which still remain of huge importance to their culture to this day. These death rites have become increasingly more ceremonious in character, and their duration longer. Every family attempts to bury their loved ones as honorably as possible, as by so doing they are able to express their respect for the deceased in a way that only they themselves can fully comprehend. The importance of death and loss within Torajan communities is perfectly characterized by the abundance of ways and nuances they are able to express grief and mourning in their dialects. 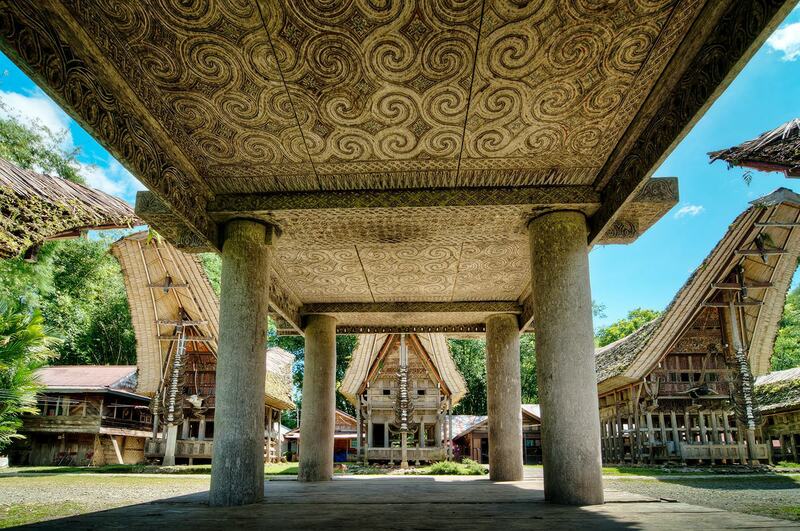 The Toraja language has a vast amount of terms to describe sadness, longing, depression or spiritual pain. There is a prevailing belief that the ability to exactly articulate psychological and physical pain of loss can ease the pain itself. Having stopped at the city of Rantapao, rumors reach my ear of a golden funeral that is to be performed in one of Torajan villages. This will be, as the name suggests, the funeral of a noble, and will no doubt entail long and elaborate rites. It’s a real joy to be at the right place at the right time – all that remains is to figure out how to get there. It’s therefore lucky that Niko, a young Indonesian man from Java that I met at the hotel, also plans to be there. The only way to find out where and when such rituals are going to take place is to either ask the locals or pay a guide. For independent travelers there is also the option of hiring a motorbike and going from village to village asking for information. After some conversation it emerges that Niko is a graphic design student who has come here for material for his thesis – a book on the Tana Toraja. Even for Indonesians, this region with its local customs and traditions has an exotic appeal – up to now little information has emerged on the subject. Nick speaks standard Indonesian – the language form widely spoken across the entire archipelago. With the help of this young man we are not only able to visit the golden funeral but also the funerals of ordinary people, and even a wedding and the consecration of ritual buildings. If you happen to be late one day – you may come again the next day, as all ceremonies last at least a few days, while funerary rituals can sometimes even last as long as ten days. Out of the two weeks that were spent in the Torajan land not a day passed without some festive rite being performed, or disturbing sight being witnessed, and, of course, there was always some new food for thought. On arrival in Torajan land one’s eye is immediately drawn to the traditional ritual houses – tongkonan. Like boats afloat in the jungle, the houses seem to strive toward the sky with their curved roofs. The name tongkonan is derived from the Torajan word tongkon which means “to sit”. Every village has its own tongkonan. Within these buildings the elders of the community reside, sharing the space between them. Each tongkonan has its own name, from which the village takes its name. 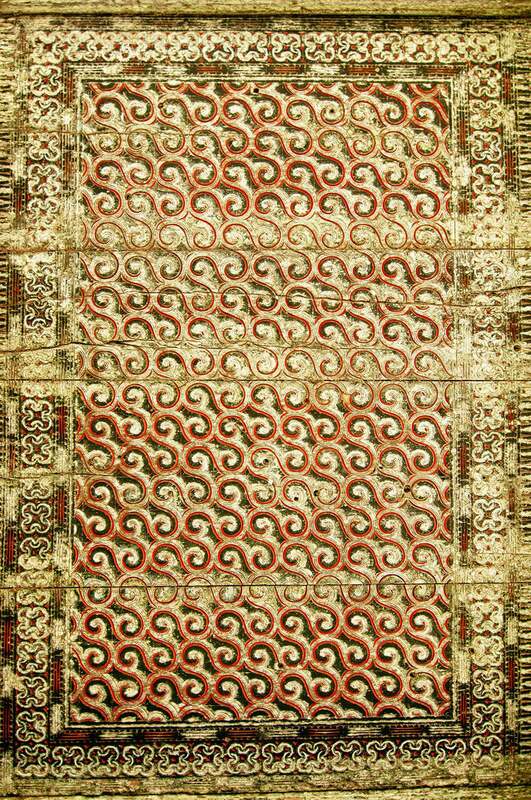 The shape of a tongkonan roof resembles buffalo horns, or perhaps – a boat by which their Torajan ancestors arrived to the earth from the sky. One more interpretation lends itself to the original tongkonan shape – the wheel of life. 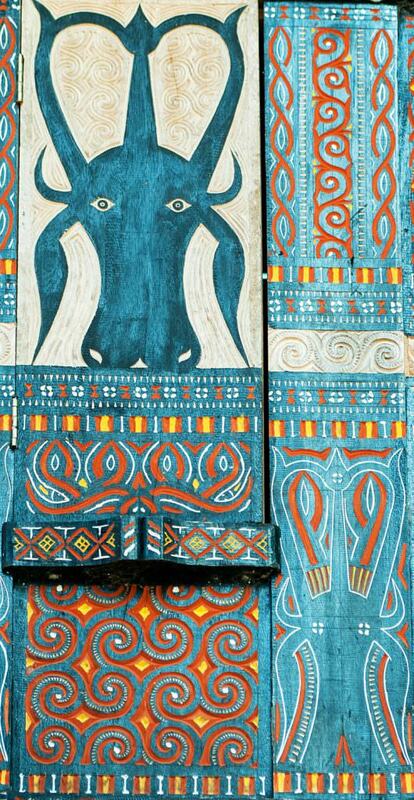 Tongkonan are heavily adorned with colorful symmetrical ornaments carved on wood. Every ornament represents an exact symbol with an exact meaning: a water buffalo, the sun and its rays, the creator of the Universe, etc. Torajans call the wood carvings pa’ssura which means “writing”. Today this type of art is often imported from Bali as only a few local villages have managed to preserve their wood carving tradition. Ma’pasilaga tedong (buffalo fight) takes place before the slaughter of the animals. After the fight, the winning buffalo is handed over to be sacrificed. The horns of buffalo are decorated with red fabric and gold decor. The Torajans believe that the sacrificed buffalo transports the soul of the deceased to the afterlife. Children of the deceased parents, wishing to express their gratitude, spend vast amounts of money on buffalo sacrifices. During the funerary ritual, women perform the Ma’katia dance to the sound of bamboo sticks being struck on wooden troughs. Usually performed by the elder women of the community draped in special costume, the purpose of the dance is to remind the guests of the generosity and nobleness of the deceased person. 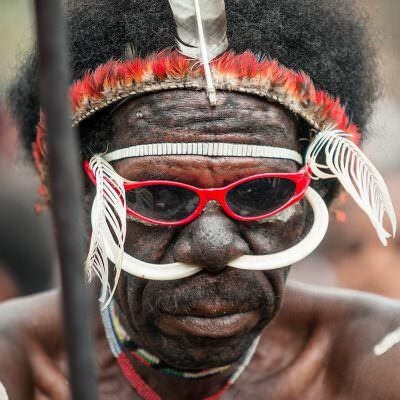 The shaman minaa – one of the most important participants in the funeral rituals – performs the Ma’randing warrior dance. The dance involves four main gestures symbolizing discipline, vigilance, cou-rage and power. The other dancers, dressed in warrior costumes, shout slogans to rally each other to fight. The origins of the Ma’randing dance lie in the Torajans’ efforts to keep their enemies at a safe distance from their village, and to protect their young girls from abduction by their neighboring communities. Torajans measure their family’s riches by their water buffalo – you can therefore gauge a family’s wealth by counting the buffalo horns that adorn the ridge of their roof. Buffalo horns are undoubtedly the most popular symbolic attribute of the Torajan culture. The sound of screaming pigs welcomes us to the scene of the ritual. Some are hog-tied and arranged in a line, whilst others, some still alive, are being roasted on a fire. Squealing children amuse themselves by dragging the freshly sacrificed bull’s head through the dirt on a string. It takes a moment to bring you back to your senses and realize just where you actually are. 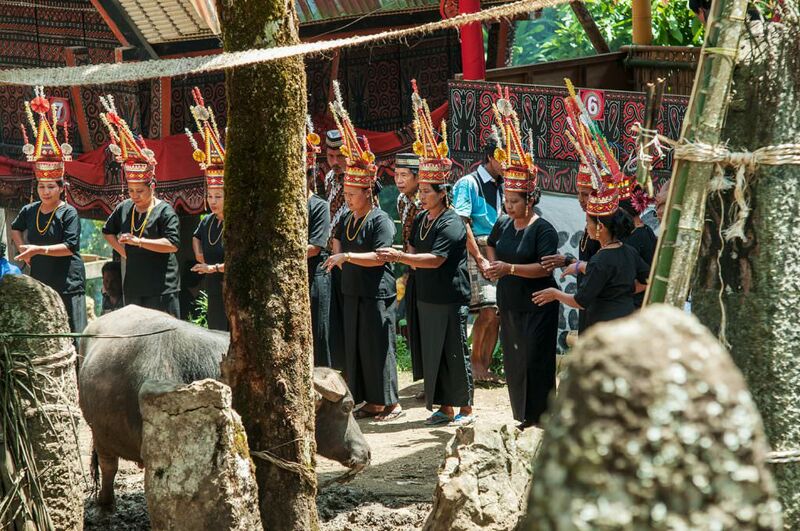 The funerary rituals of the Torajan ethnic group are strictly regulated by the Aluk religion. It is only for the noble members of the community that extremely lavish funerals are performed, while rituals for ordinary people are more modest in nature. It is believed that if a corpse is buried without a proper traditional funeral, that that soul will cast misfortune upon the entire family. The Torajan funeral usually consists of two stages: the first stage takes place soon after death, when the corpse of a deceased individual is embalmed in various plant mixtures so that it might be kept for a long period of time; the second stage is marked by a lively ceremony that can last from three to over ten days once preparatory work has been done. 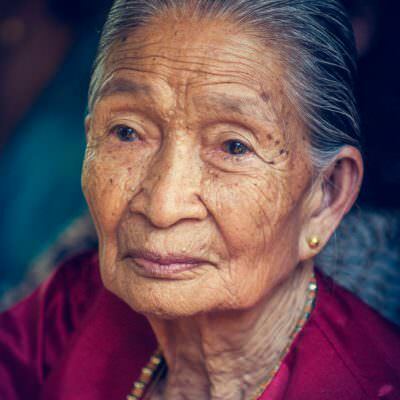 It might take as long as a couple of months or even years before a funerary ceremony can take place – this depends on how long it takes the family to raise enough money for the expenses and preparation of the burial site. The Torajans consider death not as a sudden and unexpected event but rather a gradual process of preparation for the journey to the land of Puya. 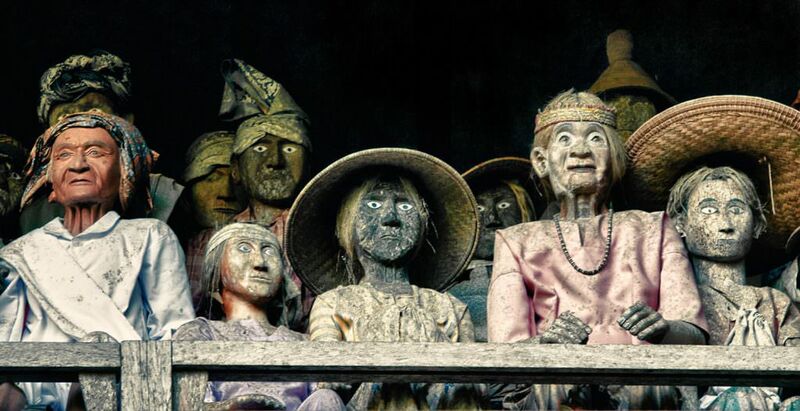 During the waiting period – between death and funeral – the deceased’s embalmed corpse is kept in a family’s tongkonan house, where the deceased is deemed to be a “sick” person. It’s a matter of honor to be invited to visit a corpse that is about to embark on its journey to Puya. Before entering and leaving the room of the deceased a visitor must receive the dead person’s permission. The soul of the dead begins its journey to the afterlife once the first buffalo has been sacrificed – it is this moment that heralds the long cycle of funerary ceremonies. 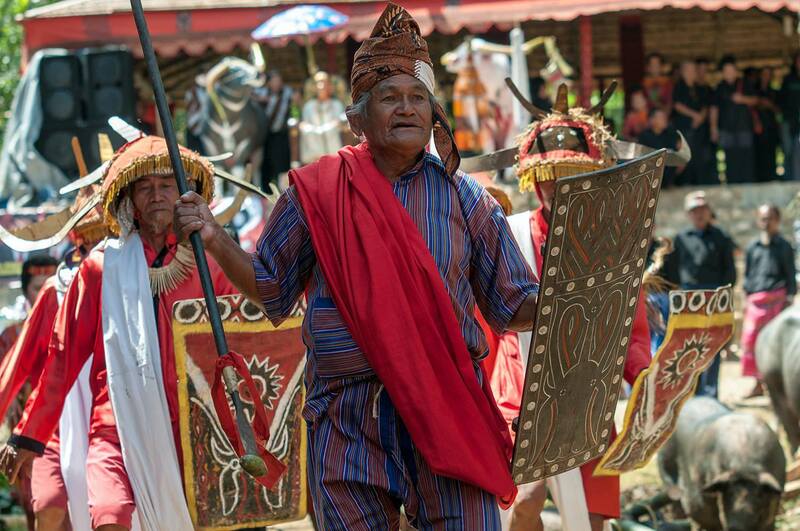 The lavish rites can attract more than 300 participants and an entire crowd of spectators – Western and Indonesian tourists and curious villagers from the lowlands. All guests come with gifts for the family of the deceased – a carton or a few cartons of cigarettes is the most common gift expected from foreighn tourists. Throughout the duration of the funeral guests are treated to rice wine served in long hollowed bamboos. The close family members of the deceased wear black or dark colored clothes. A group of elder women, dressed in black clothes and colorful head accessories, perform the Ma’katia dance which is intended to remind the audience of the generosity and nobleness of the deceased, while another group of women, wearing outfits dyed in earthly color patterns, express their grief and heartache by striking a trough with bamboo sticks. Musical accompaniment is provided throughout the proceedings by a group of teenage musicians performing with traditional wind-instruments made of bamboo who are led by a conductor. Hand in hand and arranged in a moving circle, the men pay respect by singing. This Ma’bandong dance is performed throughout the entire night and appears to be the most important part of the funerary ceremony. One of the most important roles during the funerary ceremony is performed by the shaman minaa. The minaa, together with his attendants draped in festive red-colored clothes and headdresses with symbolic buffalo horns perform a Ma’randing warrior dance. Some men praise the courage of the deceased by performing with large shields made from wood or buffalo skin and decorated with buffalo symbols. 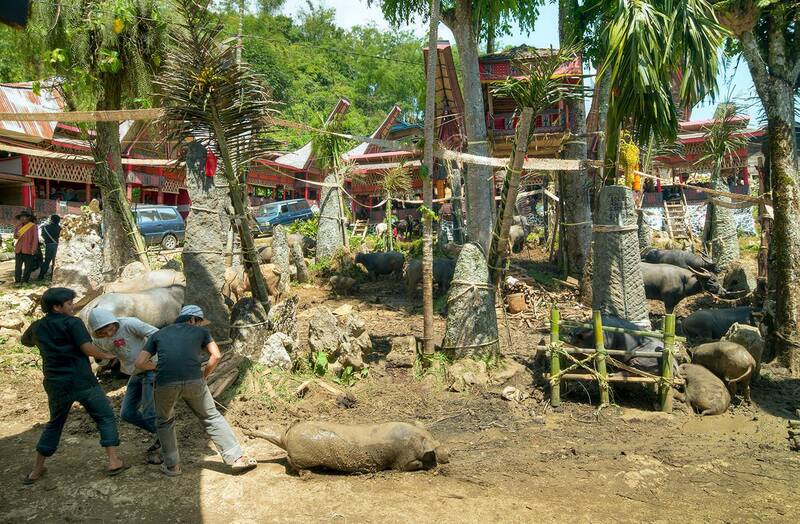 One of the largest attractions during a Tana Toraja’s funeral marathon for both children and adults is the buffalo fighting – Ma’pasilaga tedong – that takes place before the animals’ sacrifice. Enthusiastic funeral participants, caught in emotion, run amongst the buffalo screaming and jumping in the rice paddy where the fights take place. 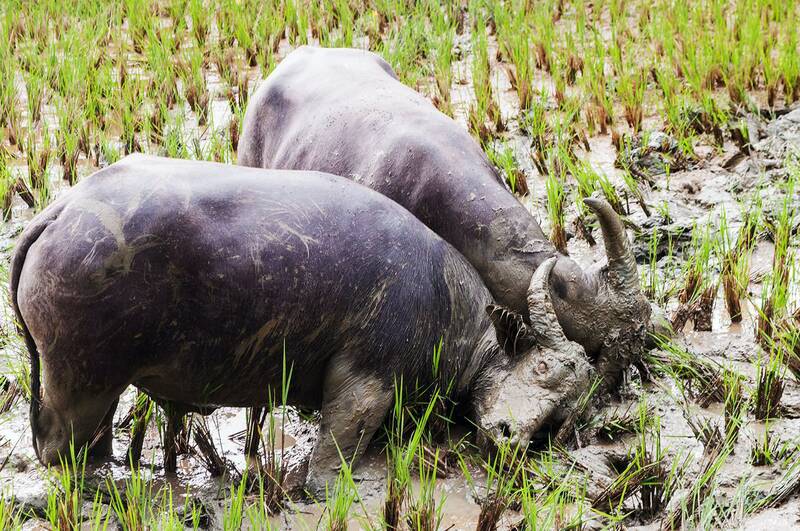 The richer the family, the greater the number of water buffalo are sacrificed in honor of the deceased. As death is commonplace, and ceremonies take place regularly not only during the funerary season, the demand for buffalo is huge. 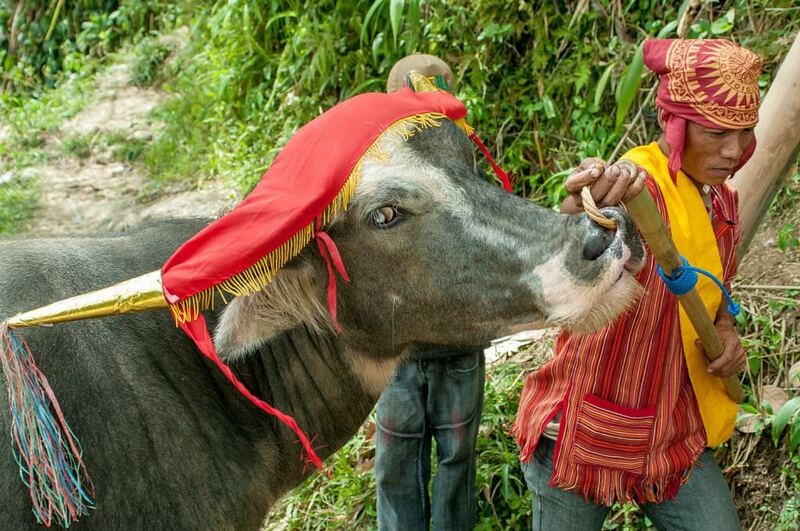 The breeding of buffalos for the Torajan rituals is a common means of subsistence for the inhabitants of the lowlands. The greatest honor that the deceased may receive is the sacrifice of a white buffalo – only a very wealthy family can afford such extravagance. The horn of the buffalo that is to be slaughtered is adorned with red and golden fabric. The funerary rituals are rather bloody affairs, with the amount of pigs slaughtered during the funeral feast outnumbering even the buffalo, while cockfights also have their place in the ceremony. During the festive period, an announcement is made over loudspeaker detailing which family or person has brought what and how many animals are to be sacrificed as “gifts”. The cheerful Ma’dondan dance takes place after the sacrifice of the buffalo and pigs that usher in the rituals of mourning, grief, respect and longing for the deceased. This dance is performed by children who clap their hands, expressing joy for the soul of the dead person as it leaves for another world. Meat from the sacrificed animals is fried and distributed to the funeral visitors – some of it is eaten during the festivities, and some of it is taken home. The Aluk indicates which part of the animal is to be given to which visitor, and this depends on the person’s position in the community. 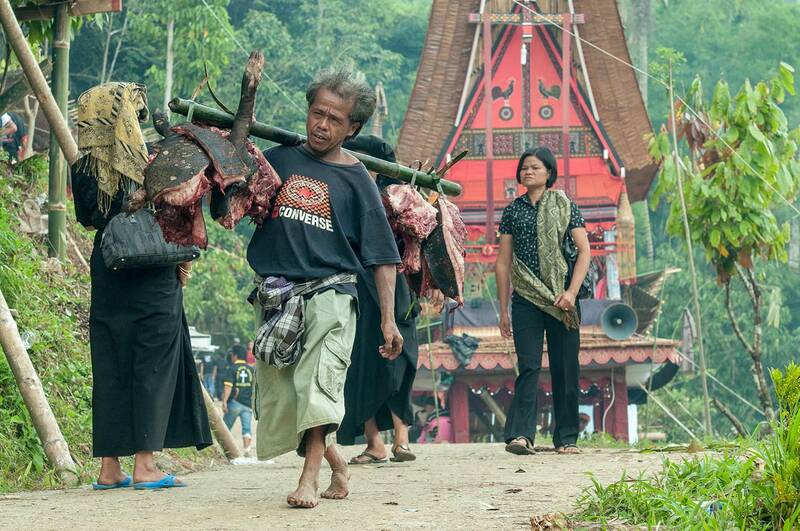 Because funerary ceremonies are a commonplace occurrence, the inhabitants of this region are always well fed; hence it’s no surprise that, in contrast with the rest of Asia, you won’t find kiosks selling fast-food in Toraja land. For vegetarians though, the closest place to fill their stomachs is Rantepao city which lies 20-30 km away from the events. The Torajans are buried according to their origin and family status. Noble and wealthy Torajans are provided with an abundance of grave goods which it is believed might come handy in the afterlife, and buried in caves or burial holes hollowed out of the sides of steep cliffs. The dead are guarded by tau tau – near life-sized carved wooden effigies that represent the dead individuals. The tau tau gaze into the distance from the balcony of the tombs. The tombs of the wealthy require from one month to two years preparation. The coffins of ordinary people or children, however, are afforded far less salubrious conditions – they are hung on cords from trees or steep precipices. When a cord rots – the coffin falls to the earth and smashes, spreading all of its contents on the ground. The tradition for burying children in the hollows of trees was prevalent until the middle of the last century. Only trees which had running sap would be chosen for this purpose as the sap was seen a representation of mother’s milk. The hollows were covered with doors made of palm leaves. A growing tree would crush the child’s fragile bones, making them one with the tree – the Torajans believed that in this way the child would be able to extend their lives. 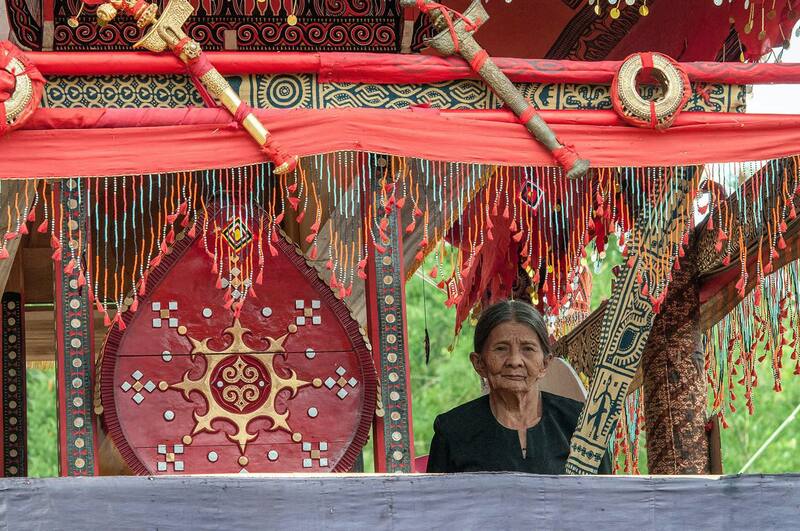 The tradition of Ma‘Nene is still very much in existence – every few years the Toraja people exhume the deceased for them to be groomed and dressed in new clothes. Relatives also attend to the grave goods and refresh the coffin, fix or replace it if it has been damaged. Once this ceremony has been concluded, the mummies are paraded around the village in an upright position with relatives in attendance. Even more mysterious and less common is the Rolang tradition – or the return of the deceased to its place of birth and final resting place. The deceased, just as in the Ma’Nene ritual, is taken to its home in an upright position. According to legend, the shaman minaa resurrects the dead person so that they might walk to their last place of rest. Out of this custom a number of legends have originated which tell of standing corpses and of the living dead that wander through the jungle. Traditionally the main period of funerary ceremonies and rituals for the grooming of the deceased takes place during the dry season – July and August – when the emigrant Torajans have returned from the other Indonesian regions where they make a living, and when the inhabitants of the surrounding environs, along with tourists, arrive in droves. 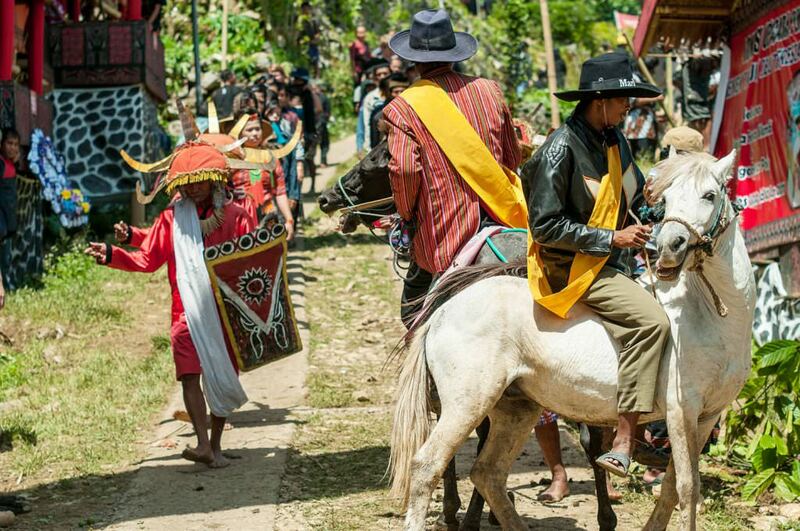 Wedding celebrations in the Torajan tradition last only a couple of days. The outfits of the participants resemble those that are worn during funerals, but are perhaps only brighter. Little girls wear bright make-up. One doesn’t, unfortunately, encounter faces that are significantly happier than those met at funerals. 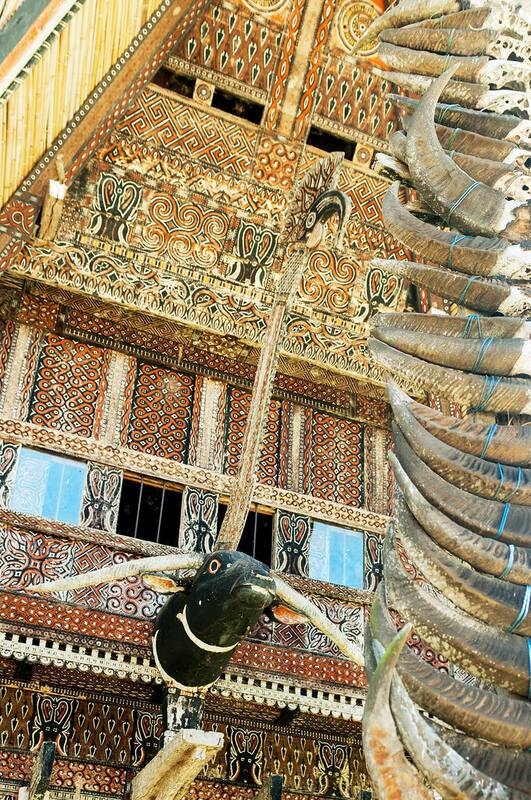 The main façade of the most important tongkonan in the community is often decorated with realistically carved wooden heads of water buffalo crowned with real horns. This symbol can only be used if the village has been host to the lavish burial of an important community member. The Torajans are descended from the Proto-Malay people who come from Mainland Southeast Asia, possibly – the present territory of Cambodia. One of the many Torajan legends tells that their ancestors were caught in a storm at sea as they migrated to the Earth from the North. During the storm their ships were irreparably destroyed, and unsuitable for sailing, they used them as roofs for their new houses. Tana Toraja does not present you with the openly smiling faces that are so common in Asia. Having devoted their whole life to mourning and bloody rituals – there’s no time for joy. Almost every single day the Torajans are faced with death and grief, and, of course, concern for how they will manage to secure buffalo for sacrifices. Their diligently maintained traditions, which attract tourists and anthropologists from all over the world, cannot fail to impress. Witnessed through the lens of a camera, the images are truly inspiring – festive costumes adorned in colorful patterns and bead embroidery; decorative tongkonan reaching towards the sky with their curved roofs; breathtaking views in the distance. However, a single glance at the ground is enough to remind you of the cruelty of the local traditions – there is only blood and the bodies of half-dead animals. You get the feeling that you are in some separate surreal world – one with its own vicious circle of events. When traditions and customs take on an importance greater than the meaning of the ritual itself, the natural essence of that belief is eroded. One has to admit that tourism and western economic models provide a large impetus for the preservation of such “shocking” or “unique” customs. The locals meanwhile cling to these rituals for fear of drawing the wrath of their ancestors – or as replacement for rice-farming, making them dependent upon money received from tourism. Although Tana Toraja is not quite a tourist destination, the number of visitors, especially during dry season, is never insubstantial. 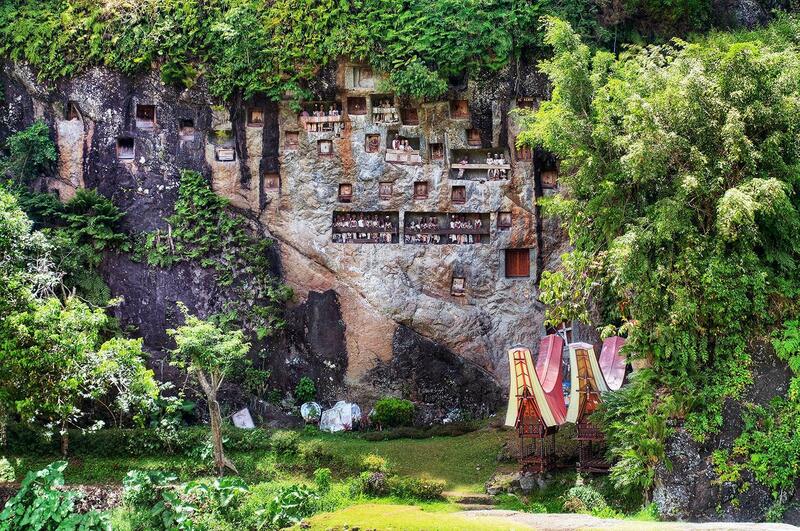 Taja Toraja is a place from whence the deceased are sent off to the afterlife. Just as the Tibetan Buddhists, the Torajans devote their life to the preparation of death. It is just that the latter chooses to prepare for death in a physical, materially expressed manner, while others choose a quieter spiritual path. The Torajans believe that tau tau – wooden statues of their ancestors that are almost life-sized – protect their villages from misfortunes and grave sites from the evil spirits. Unfortunately, the ancient tau tau have not survived – they were stolen by grave robbers or collectors back in the last century. Throughout the long and elaborate funerary ceremonies the guests are treated to fried pork and beef from the sacrificed animals, and served with rice rolled into banana leaves. The spare fried meat, following aluk traditions, is distributed to the family members of the deceased and high-ranking funeral attendants. The naturally formed Saluopa waterfall has 12 levels and is famous for its icy and crystal clear water. The waterfall is a short distance from Tantena town.